Interview with Marc Cenedella - "Start Right Now!" While in New York City recently I visited Marc Cenedella, Founder & CEO of TheLadders. TheLadders is the leading job-matching service for career-driven professionals in the USA and UK. Marc is one of those rare triple-threat leaders — super smart, charismatic and passionate. I’m always inspired after speaking to him. Entrepreneurs are, by nature, unreasonable people because that’s what it takes to start a business. The three most important questions for every entrepreneur are: “Is my service live yet? Do I have users yet? Am I getting paid yet?” If the answer of any of those questions is “no” then you’re failing. Help me to show Marc our appreciation by tweeting here! 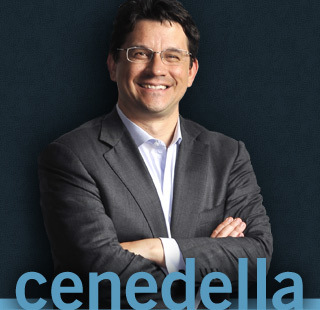 Follow Marc on Twitter at @cenedella. entrepreneurs. It’s good to see you again, Marc.Marc: Very good to see you. it takes a special kind of person to be an entrepreneur. Chris: Did you feel unreasonable when you started TheLadders.com? Marc: I not only felt unreasonable, everybody told me I was unreasonable. Internet is too low-class for them. won’t work. If everybody says, “Hey, that’s pretty obvious. for your users that hasn’t been done before. different ways. How do you know? Marc: Well, it’s not that special. It’s just, have you started yet? think in another 12 months, we’ll be live.” I said, “Wow. goes, “Well, do you have any advice for me?” I said, “Yeah. Chris: Okay. You also had a couple of others. Not live . . .
don’t have paying customers, you know that you’re failing. and running yet?” If the answer is no, you’re failing. things from my store? If the answer is no, you’re failing. get to that point, but I’m going to do everything I can. happen.” Yeah, you’ve got to go. Marc: You’ve got to have that passion and lead with it. Chris: Do you have any last minute words for our viewers? starting your business. How come you’re still here? Go. Thank you Chris for sharing this video!great advice! The world didn’t necessarily decide that they don’t need your business. They might not have even thought about it. Sure — the point is the same. The world hasn’t deigned your business necessary either by decision or by neglect. Your job as an entrepreneur is to prove to them that they do need it. Next: Are You Getting What You Deserve?